LONDON – For the past couple of weeks, the world has been guessing at how US President-elect Donald Trump will behave in office and what policies he will pursue, following a long campaign full of contradictory statements. America’s previous businessman-presidents – Warren G. Harding and Herbert Hoover – were around too long ago to provide much guidance. There is, however, a recent European precedent: Italy’s Silvio Berlusconi. What Trump has achieved, Berlusconi pioneered. Like Trump, Berlusconi is a businessman who made his first fortune in real estate. When he entered politics in 1994, he was an outsider, albeit one who, also like Trump, had long been close to plenty of insiders. America’s president-elect has done little to assuage growing anxiety, both at home and abroad, since his victory. Project Syndicate contributors explain why the fear is justified. The similarities don’t end there. Both Trump and Berlusconi are intimately familiar with the insides of courtrooms; Trump has moved fast since the election to settle fraud lawsuits against Trump University, but has about 70 other suits outstanding against him and his businesses. And both have an array of conflicts of interest with their role as head of government, thanks to their large business empires. Berlusconi, like Trump, managed to present himself as a rich man and a populist. He preferred to communicate directly with the people, bypassing traditional media and party structures. His propensity for glamorous women and glitzy homes somehow enhanced his popular appeal. The comparison between Trump and Berlusconi is far from superficial. In fact, Italy’s experience with Berlusconi – or Il Cavaliere (the Knight), as he is known in his country – provides six clear lessons for Americans and the world on what to expect from Trump. First, no one should underestimate the next US president. Already, Trump has defied expectations; few expected him even to win the Republican primary. Yet many observers continue to predict his imminent downfall, assuming that he will last only four years in the White House, if he is not impeached before that. Berlusconi’s experience tells a different story. Berlusconi, too, has been consistently underestimated by his opponents. Commentators deemed him too ignorant and inexperienced to last as prime minister, assuming that he would not survive the cut and thrust of politics or the pressures of government. Yet Berlusconi remains one of the kingpins of Italian politics. In the last 22 years, he has won three general elections and served as prime minister for nine years. Every time journalists or intellectuals have tried to take him on in public debate, they have lost. Trump’s critics – indeed, all US observers – should keep that in mind. The second lesson is that Trump will probably pursue what is essentially a permanent political campaign, injecting himself directly into conversations. Berlusconi has often used television, especially his own commercial channels, to that end. Instead of giving interviews he cannot control, Berlusconi has often worked with favored acolytes, or simply talked directly to the camera. When he was in office, many a political talk show was interrupted by a phone call from the prime minister demanding to have his say. From Trump, we should expect not just a continued Twitter barrage, but also the use of TV, including talk shows, and other channels to speak directly to the people. Trump’s decision to release a two-and-a-half-minute YouTube video laying out his priorities, in lieu of a press conference, reinforces this reading. While the approach may not seem very presidential, it works, at least when carried out by a master marketer who plays fast and loose with the facts. The third lesson from Berlusconi’s success is that even a very wealthy and powerful person can wield the victim narrative effectively. Indeed, even while in office, Berlusconi consistently claimed that he was being attacked by the judiciary, by rival businessmen, by “communists,” by the political establishment. When the chips are down, expect Trump to do the same. Never mind that he is a billionaire, born to a wealthy family, or that, in the next election, he will be the incumbent. He will consistently portray himself as besieged by self-serving enemies. Trump’s attacks on the media, often carried out via Twitter, are a precursor to this, as are his campaign vows to “open up” libel laws. His chief mud-slinger is likely to be his newly appointed chief strategist, Stephen Bannon, the former chair of the ultra right-wing Breitbart News. The fifth lesson is that Trump will probably continue to prize loyalty above all else in his administration, just as Berlusconi has. Already, Trump has made his three oldest children – who are supposed to run his business during his presidency – key players in his campaign and transition. Federal law may prohibit Trump from appointing his children to government posts, but they will surely remain at the center of his decision-making. Already, his daughter, Ivanka Trump, and her husband, Jared Kushner, attended Trump’s first meeting with a head of government, Japan’s Shinzo Abe. Even Trump’s non-family appointments – often controversial or radical figures who would not have a place in any administration except his – reflect an emphasis on personal loyalty. The final lesson of Berlusconi is that expressions of admiration for strongmen like Russian President Vladimir Putin should be taken seriously. Narcissistic lone rangers like Berlusconi and Trump are accustomed to making personal deals, and prefer other strongmen as their interlocutors. Berlusconi’s favorite overseas visits while in office were to Putin’s dacha and former Libyan dictator Colonel Muammar el-Qaddafi’s tent, not to boring European Council meetings or G20 summits. 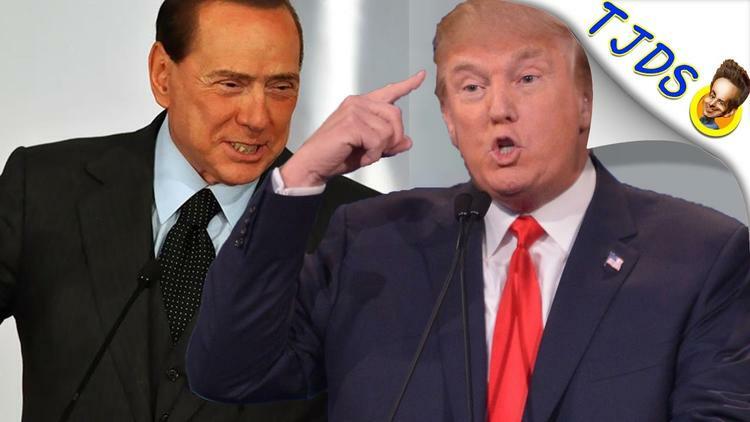 In the end, however, there is one key difference between Silvio Berlusconi and Donald Trump. Berlusconi had no real agenda while in office, except to further his business and personal interests and nurture his own power by providing resources and favors to his supporters. His greatest disservice to Italians was his inaction in the face of economic stagnation, but at least he didn’t make it worse. Trump, by contrast, does have an agenda, however hard to read. Whether it will make things better or worse remains to be seen.